Why Would Vladimir Putin Prefer Donald Trump Over Hillary Clinton? Fake news is not new. The Benghazi video story was fake news. And we also know its instigators and purpose. There have been plenty more since 2012. The recent narrative of fake-news-in-which-Obama-and-Hillary-are-victims began even before the November election, and probably stemmed from the Wikileaks disclosures from emails hacked from Hillary’s staff, themselves arising from the whole email-criminal security violations of Hillary’s private email servers in the first place. As early as 2-3 years ago it was assumed by the public at large, and should have been assumed by every security watch-dog group, private and public, that every government in the world had access to those emails that went back and forth between Hillary’s exchanges via those illegal servers. The resulting congressional investigations, still ongoing to some extent, was not to calculate if this had happened, but to measure the damage; i.e, just how much, if any, classified material had fallen into the hands of those foreign governments, friend and foe alike. That Wikileaks was able to also tap into Clinton Campaign emails, Podesta, DNC, etc, where State Department emails were found thanks to indiscretions by Huma Abedin, only magnified the problem for Mrs Clinton’s candidacy and Obama’s third term, in that it might all come tumbling down. Seeing this possibility on the horizon, both the DNC and Obama (while Hillary’s campaign was still in that pre-election glow of a pending victory) began to try to lay all these security breaches off on a more sinister enemy, some person or entity with a much bigger dog in the fight than a gravel in Julian Assange’s craw. We began getting hints that Russia was feeding Wikileaks some days before the election. But no evidence. Now, over a month after the election we’re seeing a multi-front effort to create in the public’s mind that the Russians tried to interfere in our election. Still no evidence. Jill Stein’s recount-court challenges are part of that plan, although we can’t be sure there is direct linkage, since not even real clairvoyants can read the minds of dingbats. Now we’re asked to believe “verifications” by CIA and other agencies that Russia did indeed intervene, and of course, Trump winning was the objective. But the truth and trust horizon has changed among Americans, and very quickly. For one, no one, even many (adult) Democrats who voted for Hillary, any longer believe anything coming out of the White House. And this includes CIA and NSA. Where ever fact and truth may reside on their priority list, they aren’t no 1. It’s just too big a stretch for people to believe any more, except the most gullible. And Obama can thank the hamfisted job he and Loretta Lynch did on James Comey and the FBI investigation to cement government law enforcement corruption in the peoples’ minds. More of Obama’s chickens have come home to roost. But most telling in this fake news narrative is the “dog that didn’t bark” notion that not once, not once, has the administration, DNC, nor Hillary camp ever said why the Russians would prefer a Trump presidency over a Hillary presidency. 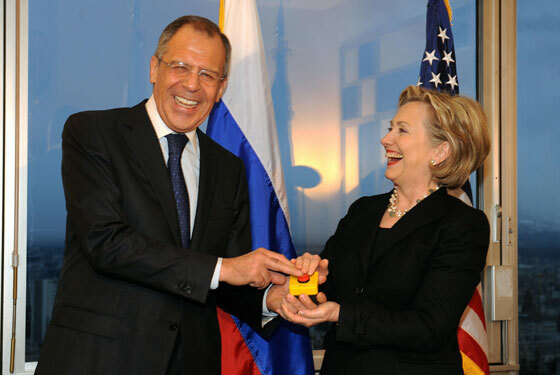 That photo, above, of Sergei Lavrov and Hillary and that insipid little red button, kicked off a string of Russian successes at Obama’s and Hillary’s expense (and arguably America’s…excepting Crimea and Syria who are probably not among them.) It’s as if, ever since Obama’s over-mic moment with Medvedev, Putin took Obama’s cue literally, and pulled out a deck of poker cards while Obama still shufflled his Old Maid deck. Syria is lost. More specifically, it will be lost to the Muslim Brotherhood, both Obama’s and Hillary’s (and Huma’s) client. So it will return to the Russian orbit as it had been years before. Russia will now have returned to the region in force, with air base and naval station on the Mediterranean. Just like the old days. And Crimea is lost, only it was always Russia anyway, having been “given” to Ukraine in the old USSR days to increase their imprimatur in the UN. As a true part of Ukraine, it was always a fiction. But with its successes, Russia has begun a process of “finlandizing” the Baltic states, and east Europe, old Warsaw Pact allies, and suddenly once again they are very afraid of the bear at their door. Putin wishes to hang a sign of strength on their door to fill the void from Obama’s withdrawal and fecklessness..
As for the Middle East, with an Iranian nuclear hegemony on the horizon, and mass tribal death from Aleppo to Libya, Bart Simpson couldn’t have made a bigger mess of the region than Barack Obama and Hillary Clinton have. No historian can apologize their way out of this truth on the grounds of good intentions. All these things will soon be on Donald Trump’s desk, and I’m sure Putin will find moving ahead far more difficult should he press his luck. Personally, I think he’ll pull up, accept his gains and count himself lucky.. But a new kind of cold war will ensue, which, within four years, the Left will blame on Trump just as they were able to call Vietnam “Nixon’s war” by the time the Paris accords were signed in 1973. As Chico Esquela (Garret Morris on Saturday Night Live) might have said, “Obama hab been berry berry good for me”, so Putin might think it wiser to simply hang up his cleats and count his gains instead of pressing his luck and end up licking wounds instead. He and his military know things about the American military (and their own) most of us do not know. Putin is no fool. There’s no telling what the Russian Empire would look like by 2020 with a Hillary presidency. Or the emerging Iranian Hegemony. Or the gender-fluid (don’t you just love that term?) American military after another four years of emasculated toads have managed it into near-oblivion. But I think that hers is the world Vladimir Putin would have preferred to see emerge from the 2016 election rather than the emergence of a Donald Trump. Was Hillary Clinton the Head of Her Class, or Just the Head of a Big Pimple?